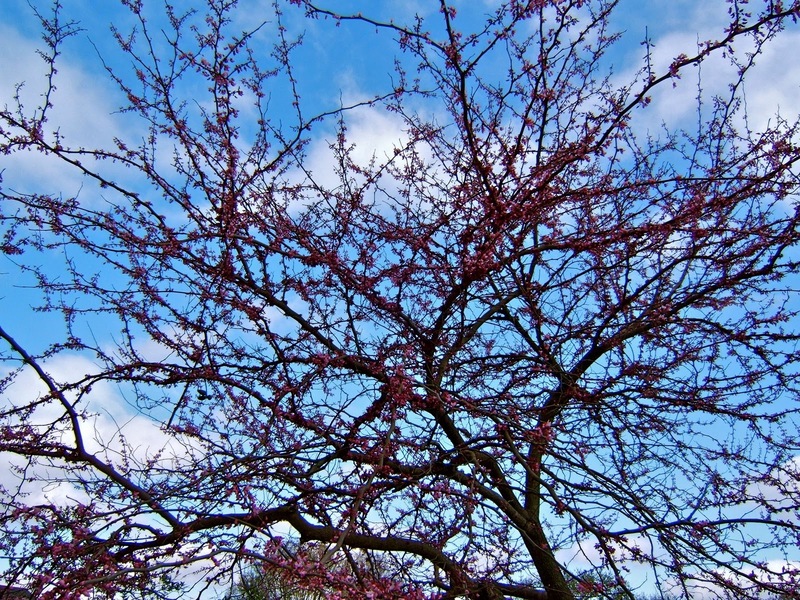 Since I last posted spring pictures the flowering crab apple trees have been giving us a show. That's the one in our yard. The white flowers under the tree is Candy Tuft ... it is just beginning to blossom. I like that it's an evergreen ground cover the rest of the year. And the pansies are beginning to bloom their little heads off after very little show through the winter. There are a number of lighter pink as well white crab apple trees in the neighborhood. These trees loose their blossoms one petal at a time. 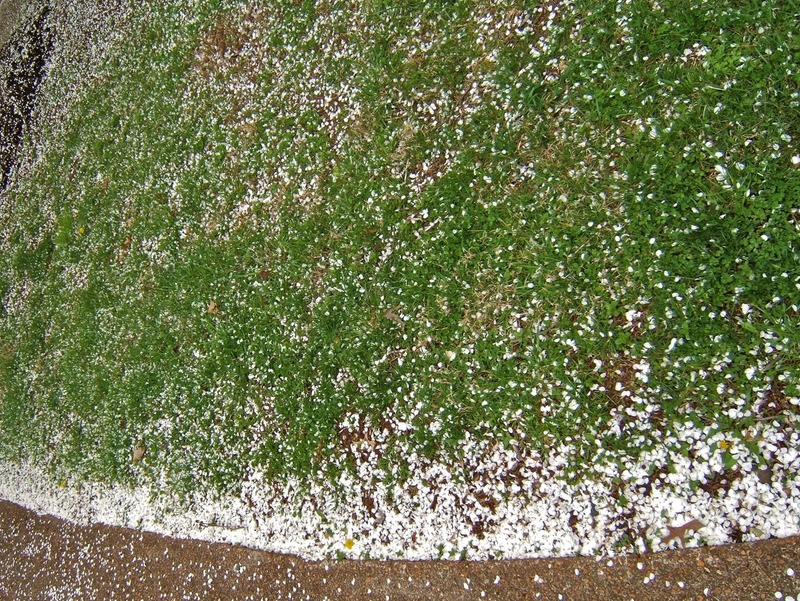 It looks as if it snowed under the white ones. 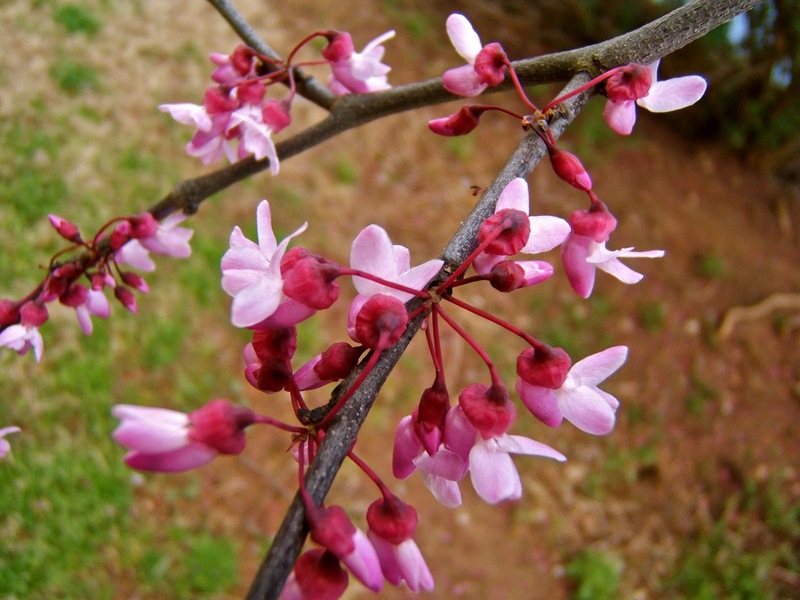 The Red Bud trees have just begun. They are one of my favorite trees. 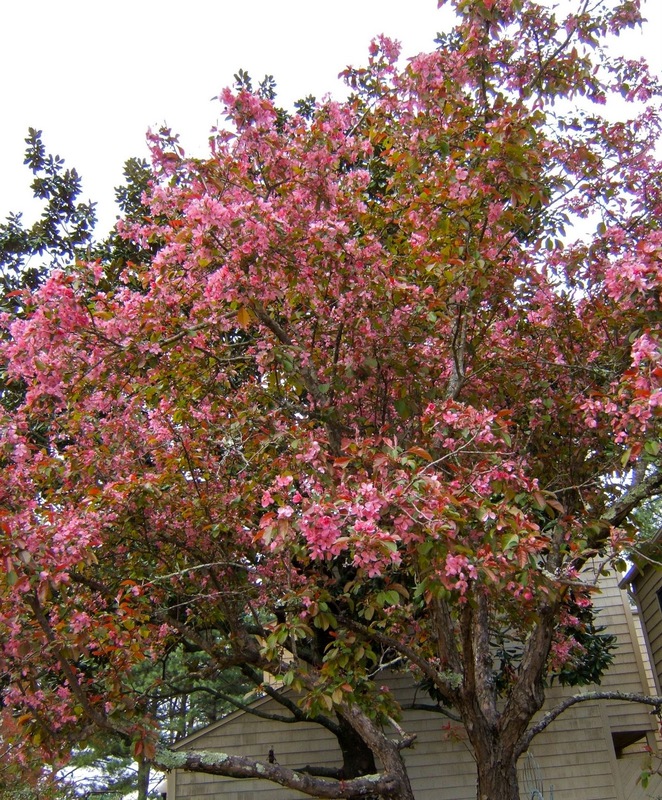 If anything ever happens to the crab apple in our yard that's what what will replace it. I'm very fond of their delicate small blossoms. 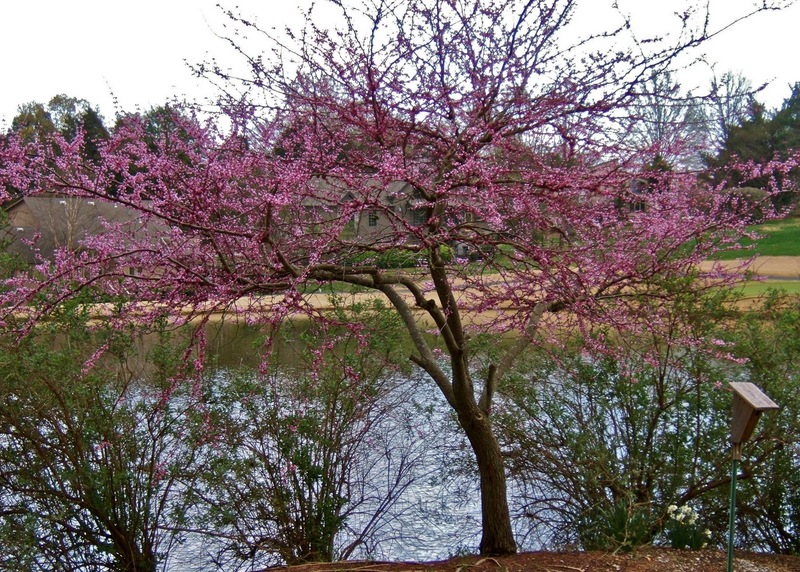 That particular red bud tree is on the golf course. 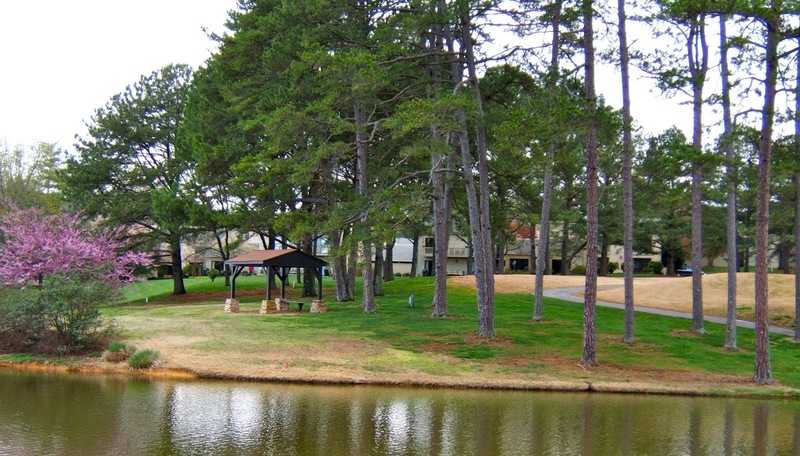 We get to enjoy it from our patio as well as on our walks with the dog. Yesterday late afternoon when I took this picture, the light was such that the trunks of the evergreens were violet as well. And then there's the grass ... or I should say grasses. The fairways of the golf course have Zoysia grass which turns brown with the first frost, but greens up within a few days ... that will happen soon. The grass on our grounds and most everywhere else stays green all winter. 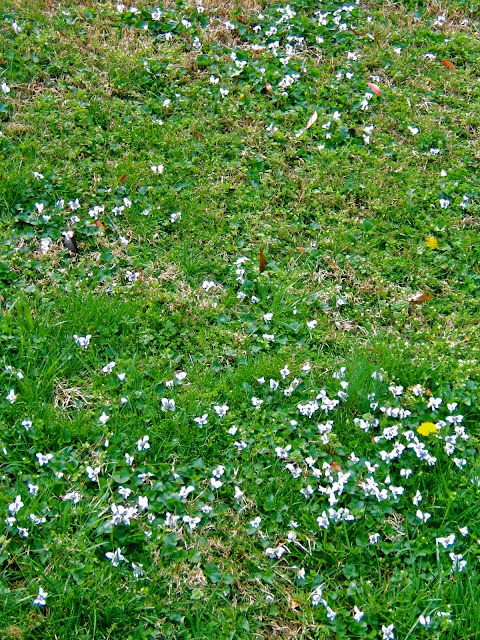 Right now the dandelions and violets growing in it are making a wonderful show. This patch on a sunny hillside has the light blue violets. There are purples ones elsewhere on the grounds. I love spring and am looking forward to what's still to come ... the dogwoods and azaleas are the next to make a spectacular show. 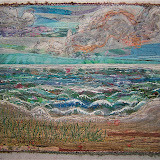 A slide show of all the quilts in the show is now posted on the guild's website. Click here to see it. 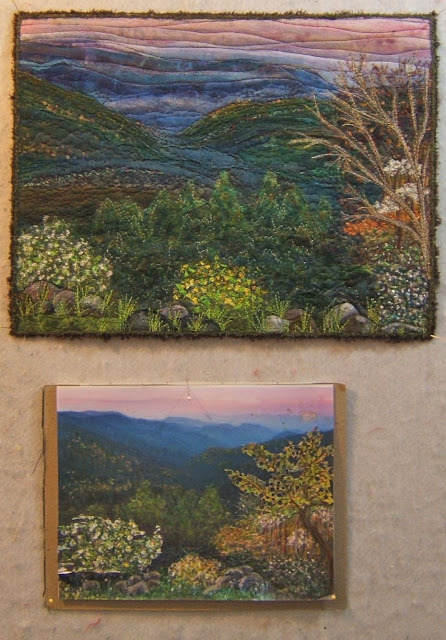 I took photos from the slide show to fill in the gaps of the missing pictures for the special award winning quilts in my previous post. So you may wish to reread that post. 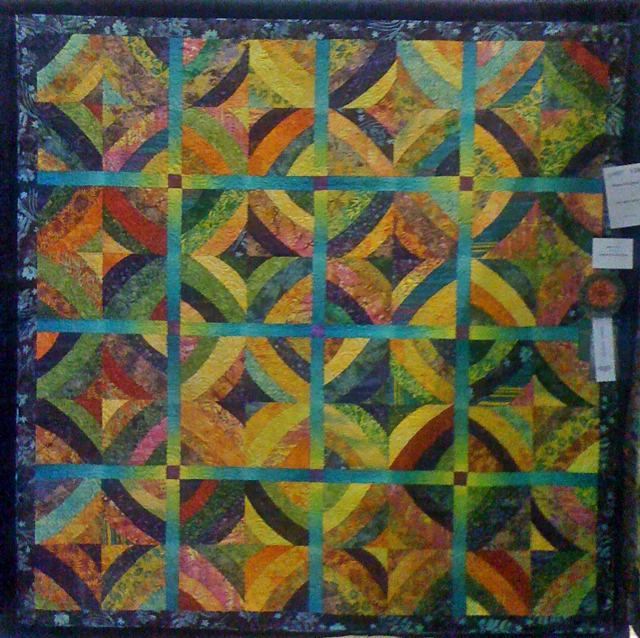 The quilt that gets the viewer's choice award is determined at the end of the show when the votes are counted. "Morning Glory Madness" by Joann Webb, Grain Valley, Missouri is the winner. Joann wrote this about her quilt in the show booklet, "The three dimensional floral Garden City Gateworks blocks led me to create my vision of an iron trellis with climbing morning glories in the setting. 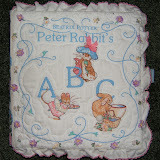 It is appliqued and quilted by hand". The Smoky Mountain Quilt Guild Show began last Friday and went through the weekend on the campus of Maryville College in Maryville, Tennessee. I was again in charge of the special award ribbons. This involved inviting talented members of our guild to create some of the rosettes and then my printing and constructing them. My time at the show was limited this year and I didn't take as many photos as I would've liked. 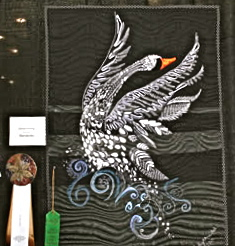 The "Best in Show Wall Quilt" was awarded to Peggy Garwood of Fairfield Glade, Tennessee for "Simple Gifts". The award money was sponsored by the SMQ Guild and the rosette was created by me. 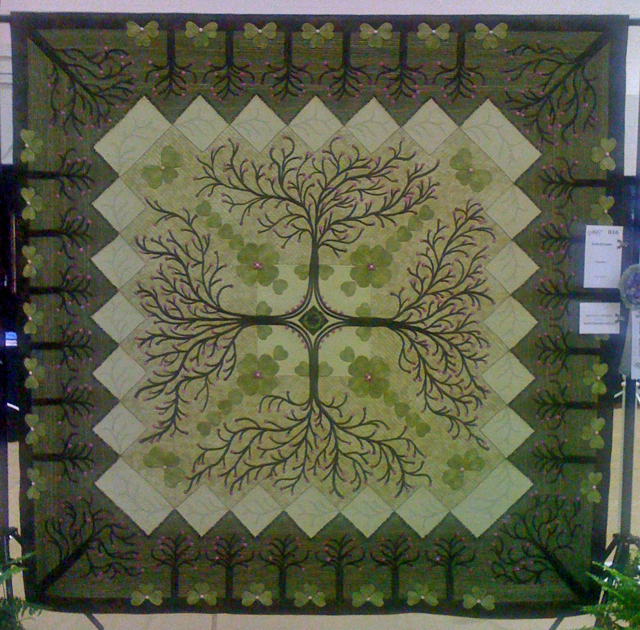 The "Best in Show Bed Quilt" was awarded to Linda Roy of Knoxville, Tennessee for "Redbud Ramble". 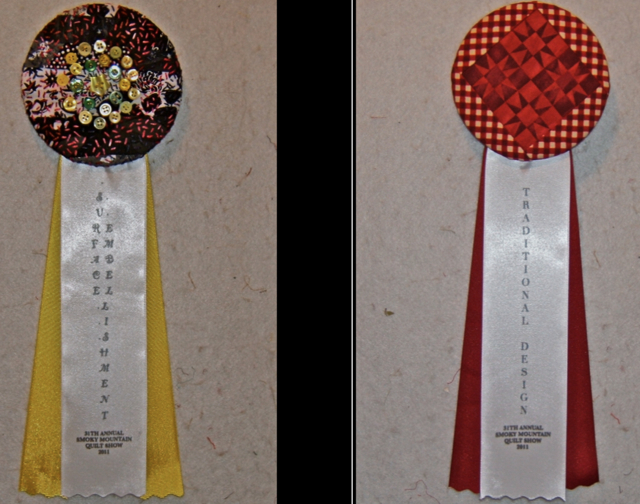 The award money was sponsored by the SMQ Guild and the rosette was also created by me. The "Hand Workmanship" ribbon was awarded to Peggy Garwood's "Best In Show" wall quilt. 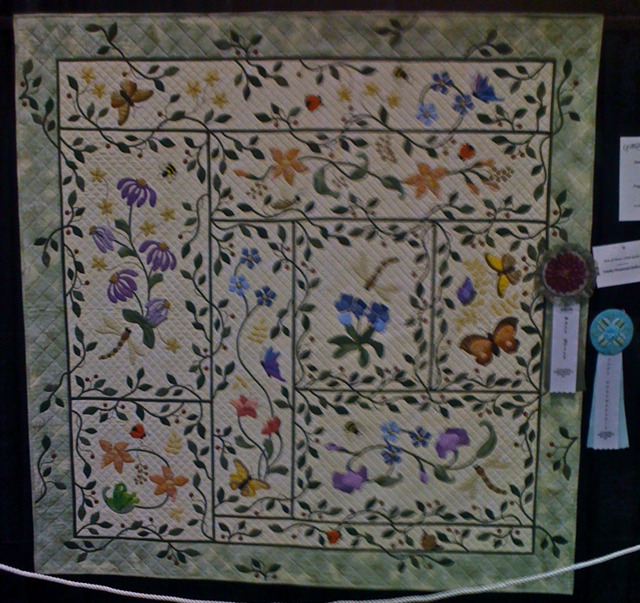 It's rosette was created by Linda Roy and the award was sponsored by Tuesday Bee of the SMQ Guild. 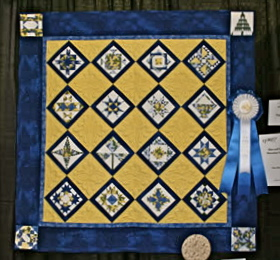 The "Excellence in Machine Workmanship" ribbon was awarded to Rose Remund of Loudon, Tennessee for her "Blue and Yellow Miniature Sampler". 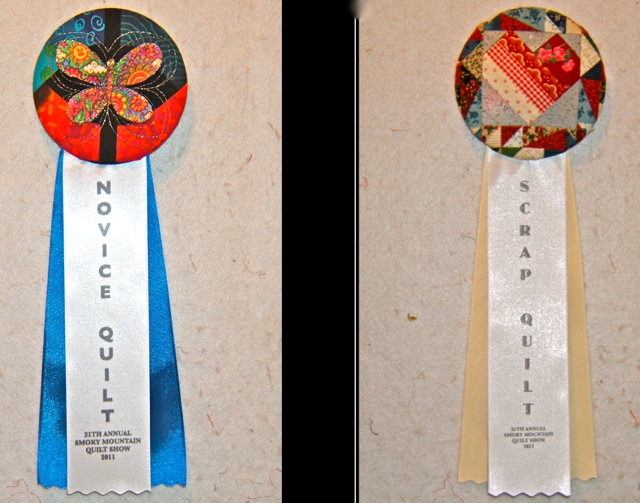 I made the rosette and it's sponsored by Quiltbee's Long Arm Quilting. 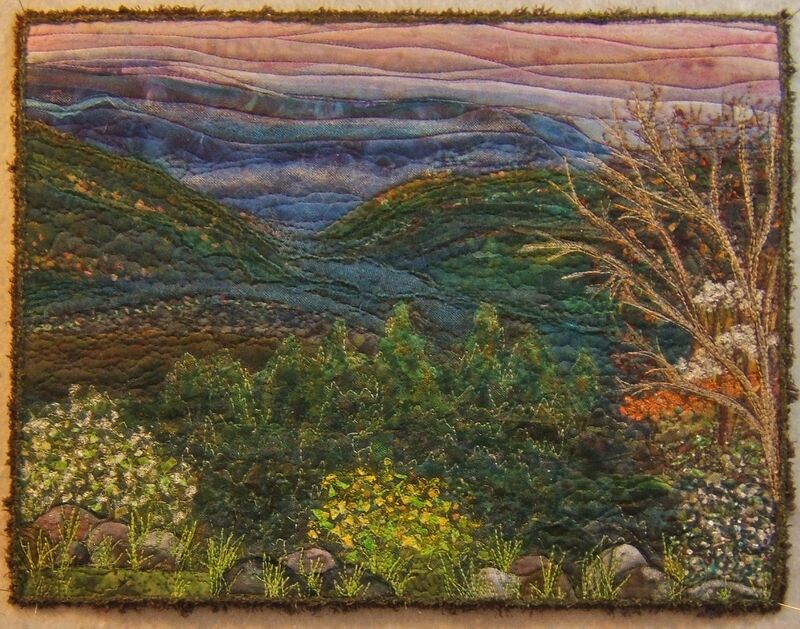 The "Surface Embellishment" ribbon was awarded to Beverly Hertler of Red Bank, New Jersey for "Seasons IV-Toward Winter" which also won 2nd Place in the Art Quilt category. 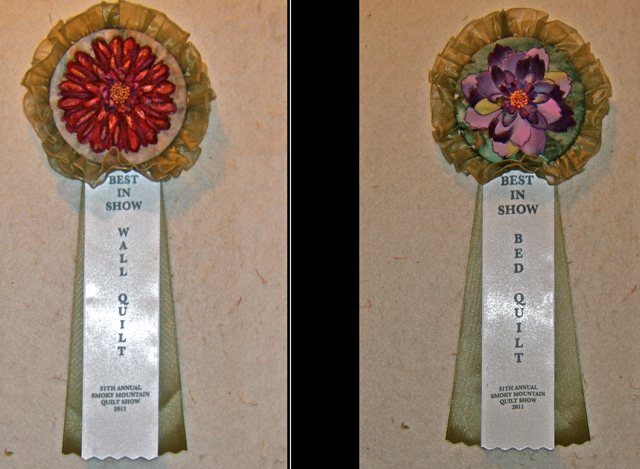 The special award rosette was created by Tone Haugen-Cogburn and the award sponsored by the Cherry Pit. 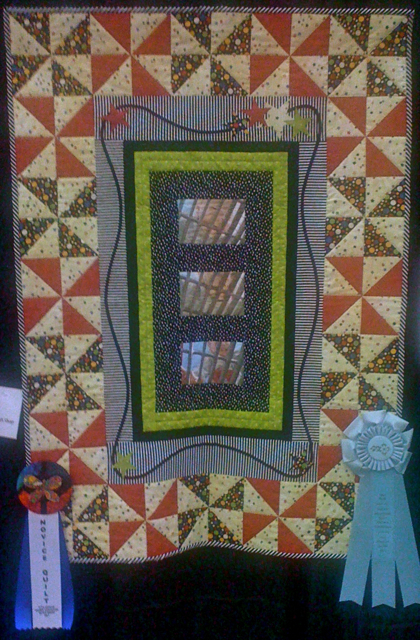 The "Traditional Design" ribbon went to Pat Kuhns of Lincoln, Nebraska for "Solitaire". 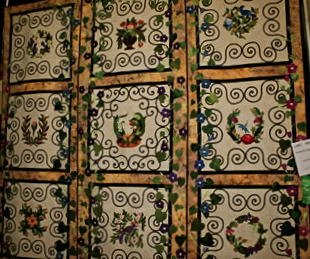 The rosette was created by Loretta Painter. Loretta also sponsored this award. 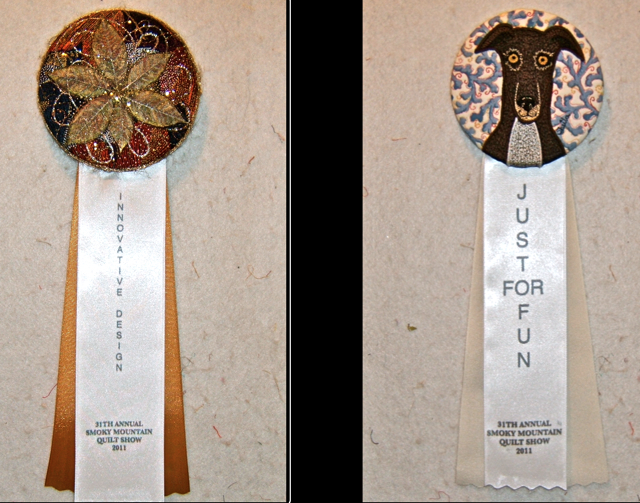 I created the rosettes for both of these ribbons. 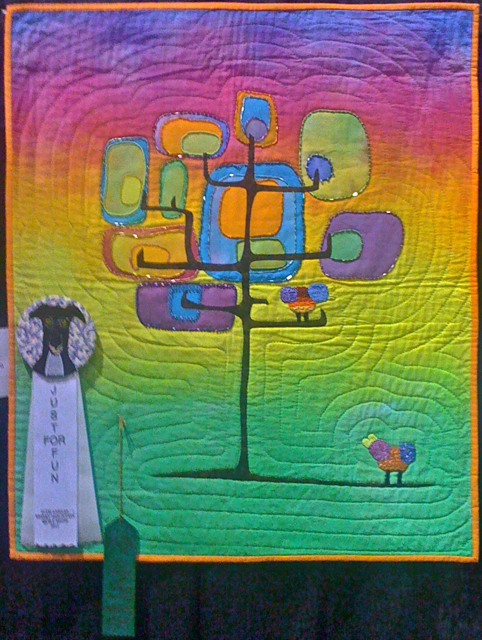 The "Novice Quilt" ribbon was awarded to Kathy Dittmaier of Townsend, Tennessee for "Wyatt's First Trip to the Playground Mimi". It was sponsored by the Mountain Creek Quilt Shop. 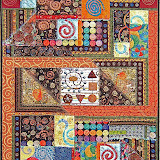 The "Scrap Quilt" ribbon went to Donna Wiffen of Oak Ridge, Tennessee for "Scrap-Happy Nine Patch". 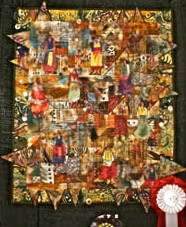 The award was sponsored by Gingersnap Quilts. 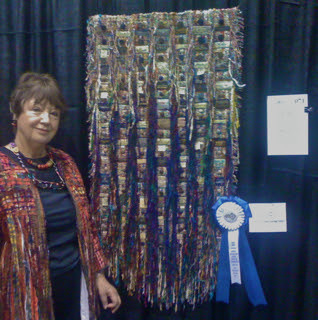 The "Innovative Design" ribbon was awarded to to Judy Freidel of Hot Springs Village, Arkansas for "The Landing". I created the rosette and the award was sponsored by Thursday Bee. 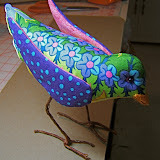 The "Just for Fun" ribbon went to Bonnie Ouellette of Seneca, South Carolina for "A Little Birdy Told Me". 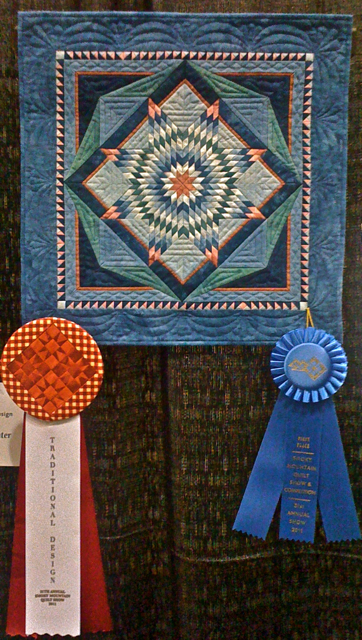 The rosette was created by Sheila Raun and the award sponsored by Linda and Pete Claussen. The voting public awarded the "Viewer's Choice" ribbon is determined at the end the show. 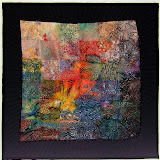 "Morning Glory Madness" by Joann Webb of Grain Valley, Missouri quilt got it. 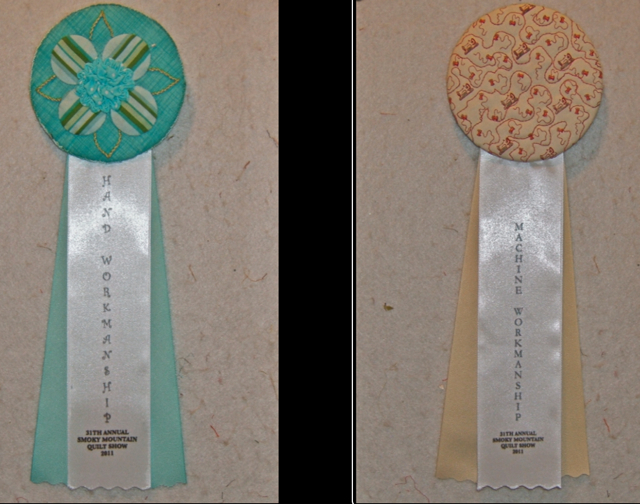 The "Judge's Choice" ribbon was awarded to Tone Haugen-Cogburn of Maryville, Tennessee for "Mirror of Eri(n)sed". 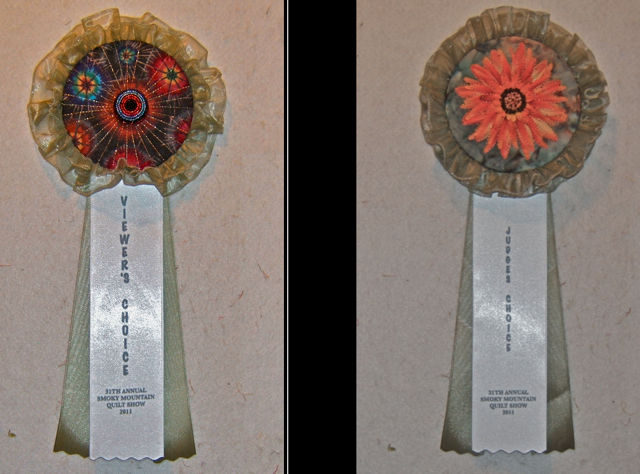 I created the rosette and the sponsors were Gene and Christine Glazer. 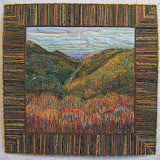 in the Art Quilt Category. That was totally unexpected. I thought that if it were to get any recognition at all, it might be the "Innovative Design" ribbon. I expected for it to raise controversy more than anything else with reactions such as, "You call that a quilt?" I understand it got a lot of attention. 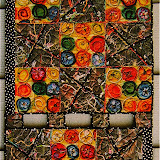 If you'd like to read how this quilt developed go here. PS: A tutorial for making award ribbons is here. 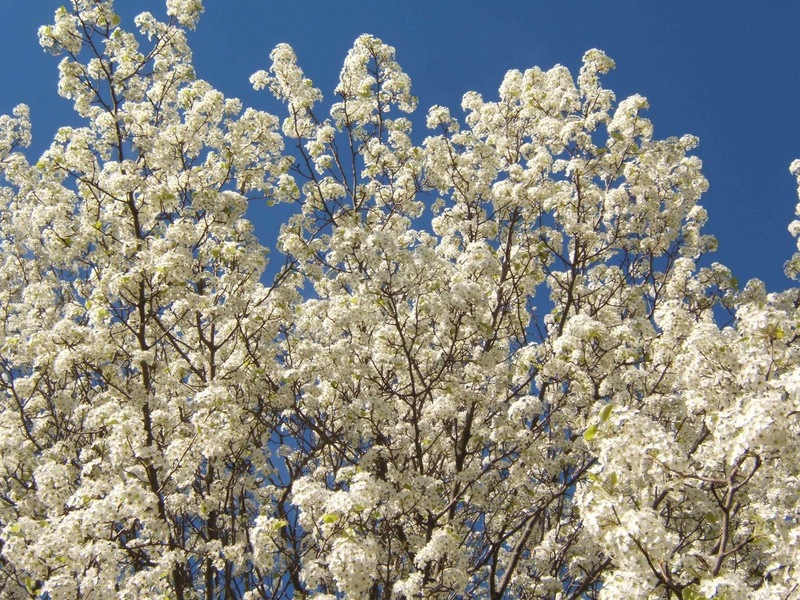 Ornamental Pear trees are the first to blossom in our area. The flowers last hardly a week. In the meantime these solid white trees are glorious. This beautiful Red Tip tree/shrub looks like this now, too. 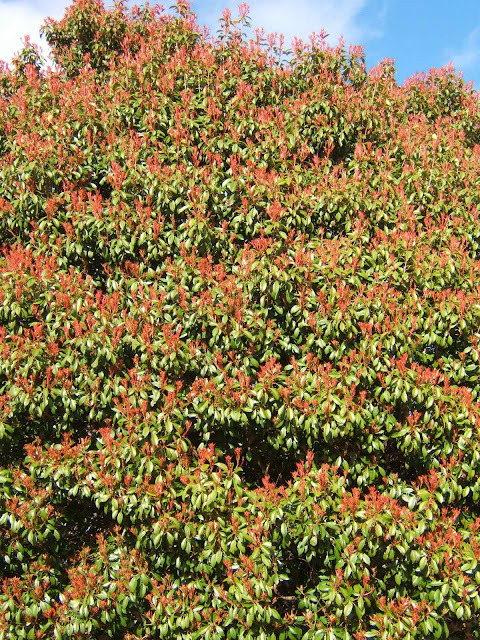 The red parts are new leaves sprouting from the tips of the branches. This plant looks deciduous, but it's an evergreen. 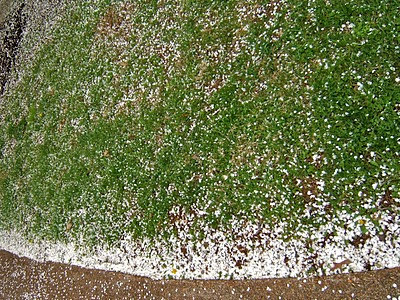 It, too, will have sprays of tiny white flowers in about a month. 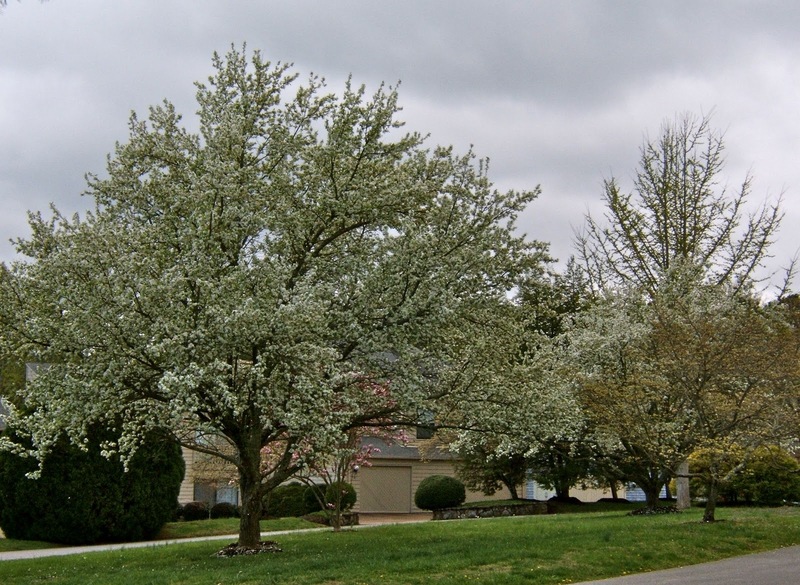 Both this and the Ornamental Pear trees were new to me when we moved to Tennessee. I still marvel at them, as well as all the other shrubs and trees that either remain green throughout the winter or burst with blossoms in the spring. This wonderfulness is just the beginning. 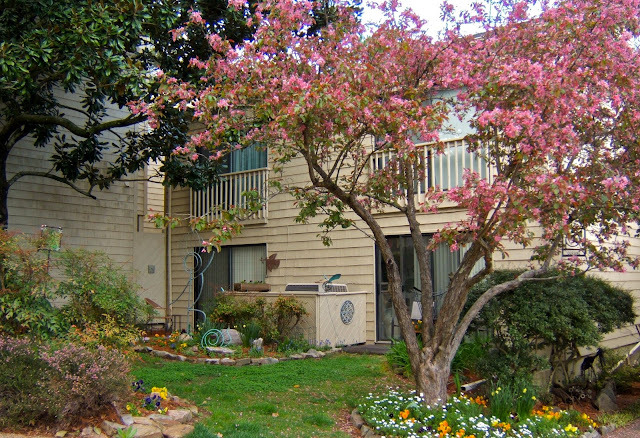 The flowering crab trees will be blooming by this weekend. 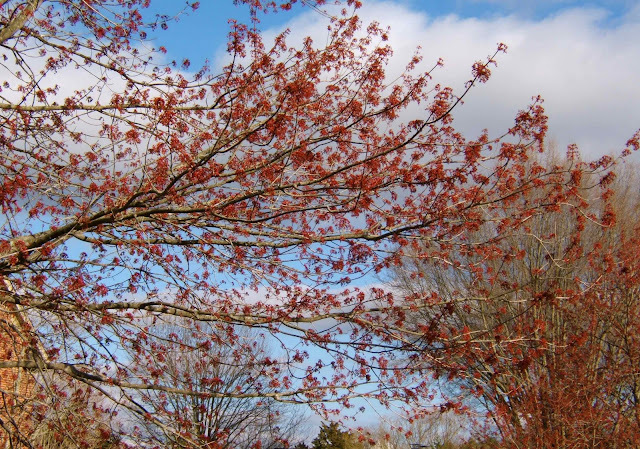 Then before we know it, the Dogwoods and azaleas will create a full bloom wonderland. Spring is wonderful most everywhere, but I've never experienced such an abundance of spring flowers anywhere else that I've lived. ... before I got out the pastels ... before a lot of the middle and fore ground details were added. Working through this first one has helped me to more clearly see the range of hues that I need to be gathering from my scrap bags. I'll again be going through those first two that these bits and pieces came from. 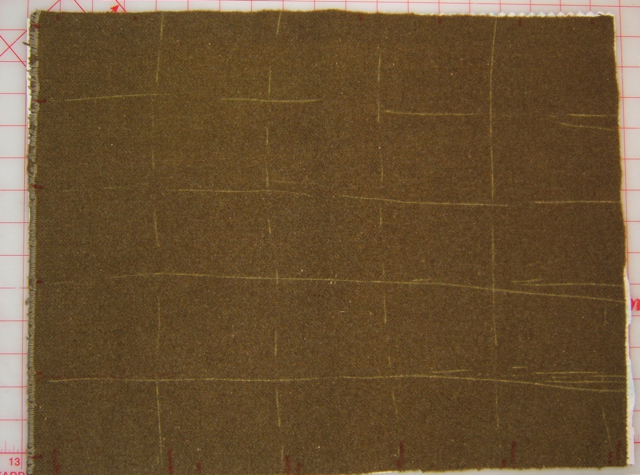 Here are the fabric and paper studies together. I already see changes I want to make to the composition. 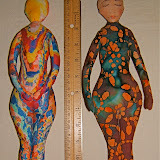 There'll be time for another fabric study before we have house guests next week. *The paper/pastel study is number one. Since ArtPrize 2010 ended last October, I've been tossing around the idea of creating another BIG installation piece for its next competition/exhibition. The big question in my mind was whether I had the stamina and the desire to put all my efforts into another humongous 9' x 7' art piece. The answer is YES! 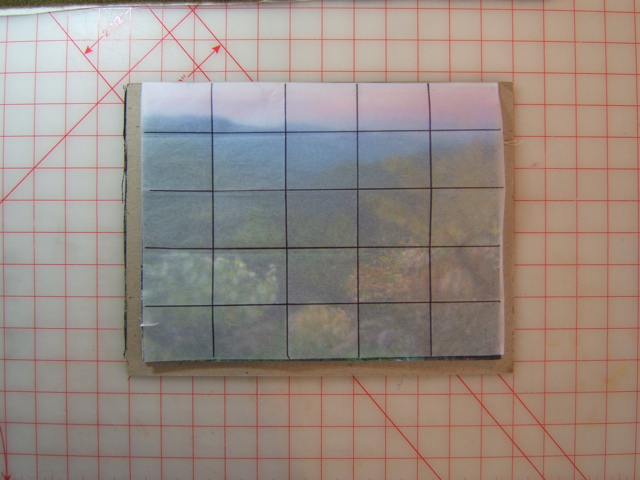 Last week I printed out reference photos and did a lot of cutting and pasting, as well as pastel work to make a paper mock-up of what I have in mind ... the Smoky Mountains on a spring morning. I love mountains as much as I do Lake Michigan. 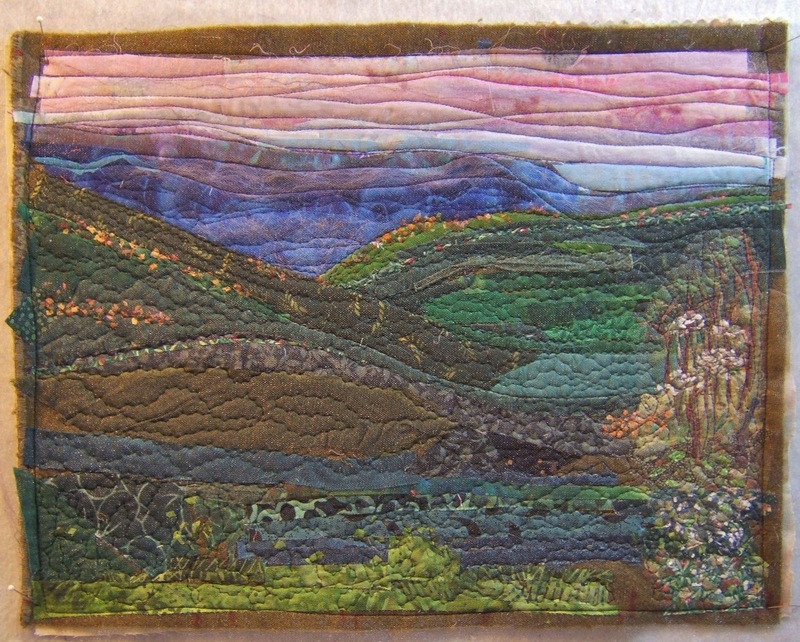 This one features the Smokies, which is only an hours drive away, but there's a strong influence of the Rocky Mountains in my feeling about doing it. In fact, quite a few of my reference photos for the perspective of looking down as well as up nearby slopes were taken in Colorado. 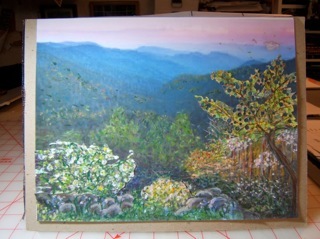 I've spent the last 20 springs in the Smoky Mountains, so that range is featured in this piece. Finally, my schedule and studio are clear of other projects and obligations so I began a small fabric study. 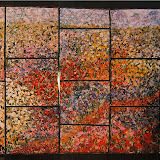 I had determined how the composition is to be sectioned for 25 panels on the paper mock-up. 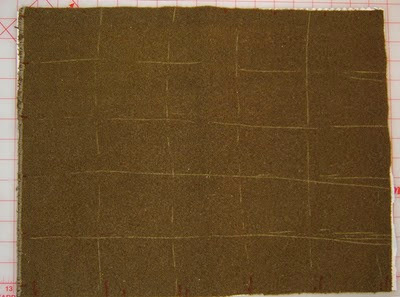 I sketched in the divisions on the army blanket that serves as the bat ... keeping in the spirit of recycling materials for my "ortwork" technique. 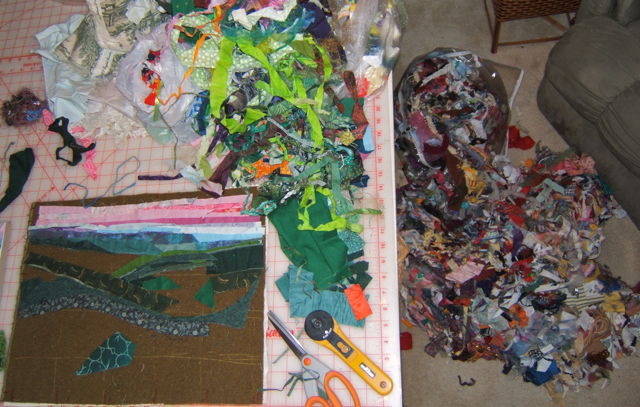 I got just so far before I ran out of dark green scraps from the bag on the table. Another bag was brought in from the garage to dig for and sort out possible bits and pieces to continue with this piece ... and for the next larger study with more details I plan to make before work begins on the BIG one. There's lots of digging through many big bags in my near future. 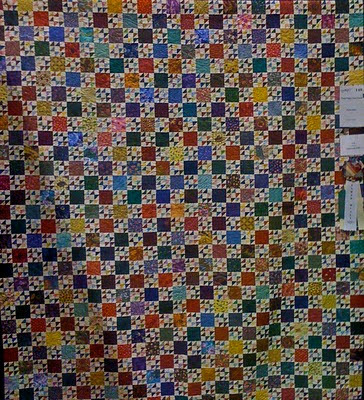 Waiting In New Orleans - 19"x 23"
This is the third weekly Quilting Gallery contest I've submitted to. 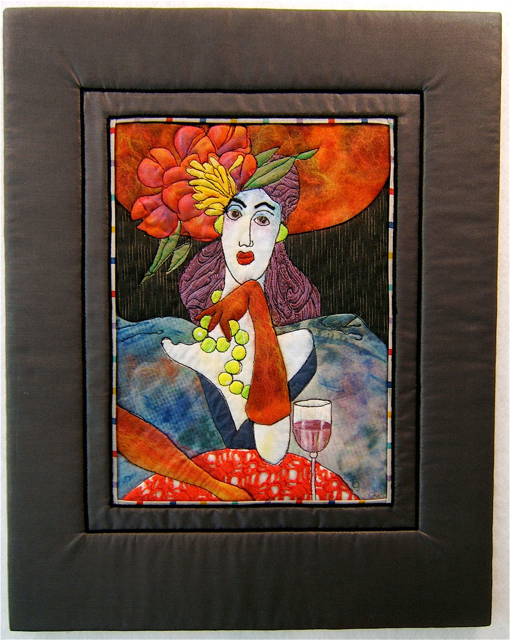 The theme for this one is "People and/or Face Quilts" (click to see gallery). 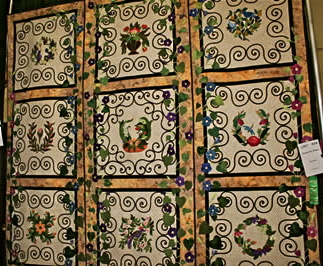 There are 17 quilts from 7 countries. 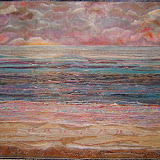 So click on over to see some wonderful quilts and vote for the one that you like best. 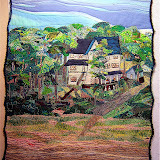 To read about the making of my quilt go here.